Construction of fences from a stone. Construction of fences from a stone, a facing brick. For every taste customer. 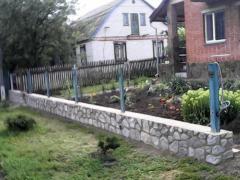 Unbelievable price on Fences and barriers construction and installation in Velikaja bagachka (Ukraine) company Vlasnij sad. Marchenko, ChP. Wide choice of quality services at affordable prices.